Since moving in together, Bianca and I have spent a good chunk of our days talking about the future. Like any life partners/best friends/business partners, we often reminisce on the good times, laugh about the not-so-preferable times, rant about boys, and ponder what ~could be~ if we could just drop all of the aforementioned and focus on what we’re really seeking out (of life, Kastor & Pollux, lunch etc). And while we’ve already established that these conversational elements are definitive of a working relationship, I think the more important thing to note is that they’re definitive of what Kastor & Pollux is. It’s a life(style) deal, sort of thing, and when we’re not thinking about lunch, we’re thinking about how lucky we are to be able to sustain all of the things that we love doing under one big umbrella that is rooted in both friendship and good times. 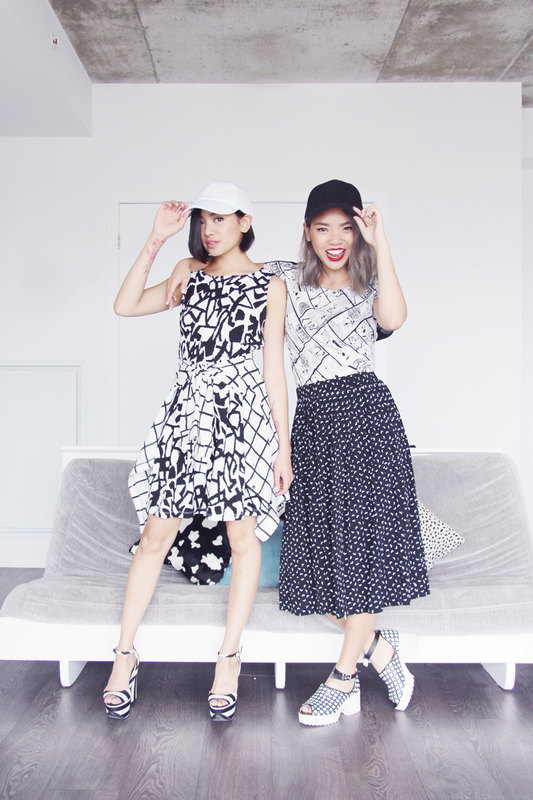 There’s a certain level of transparency in the blogging world – and while I understand and appreciate its value, Bianca and I have made it clear from the get-go that we won’t be doing it forever. We’ve never been ones to put all our eggs in one basket (and even though this means that we often wear ourselves thin), we’ve been lucky enough to find interests outside of styling clothes, posing for pictures, and writing generic copy. This might seem a bit left-field, but when I seek out a brand deal, I write an elaborate pitch about what Kastor & Pollux is. However, as time has passed, I’ve realized that successfully “selling” yourself is really difficult when there’s no divide between you (as a person) and you (as a professional). Nonetheless, I’m going to consider you, our audience, as a new brand deal, and take a hot moment to sell ourselves to you. Kastor & Pollux is, generally, a creative outlet. 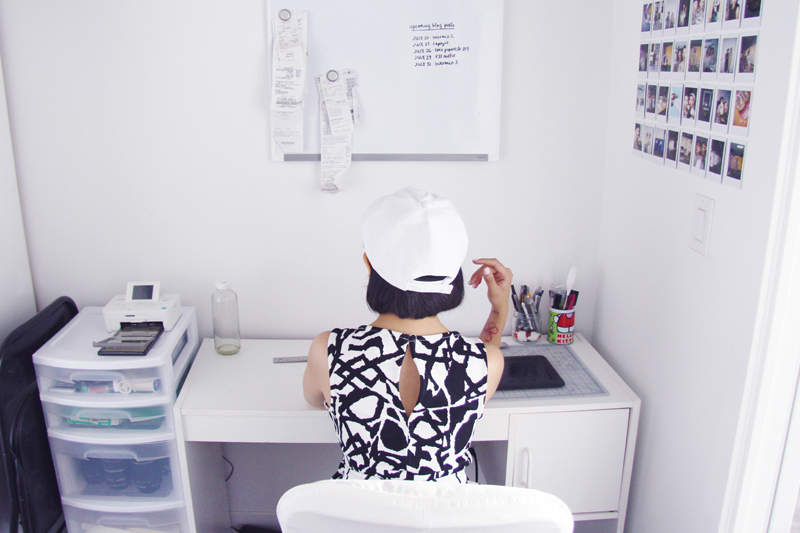 We design, source, and create clothing and jewelry. We code, occasionally. 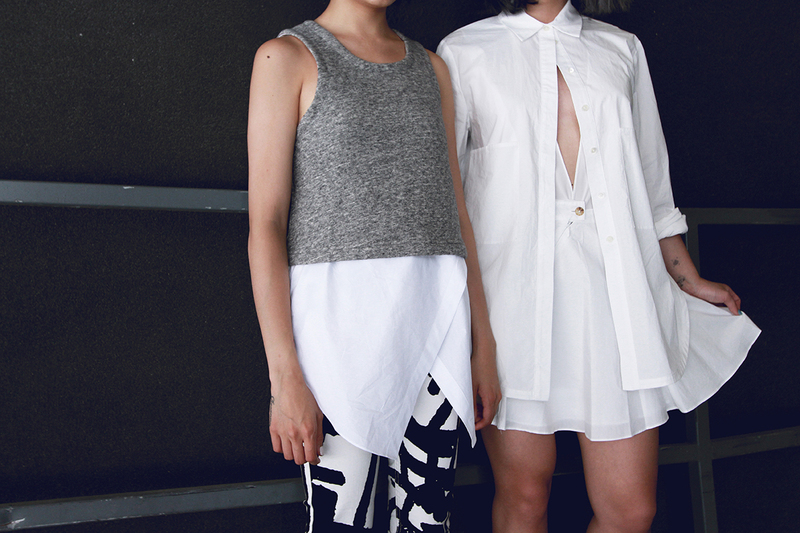 We illustrate, collage, and relentlessly use VSCOCam. We come up with obscene video ideas and [lovingly] coerce Olivia into executing them for us. 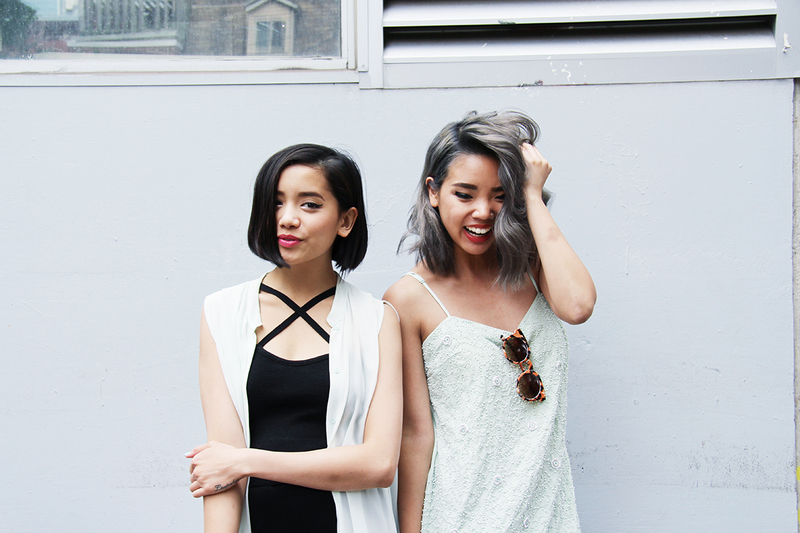 We blog (duh). We do…well, anything that we want to do, really. But at the same time, we are also a business. We package said clothing and jewelry up and send it to you. 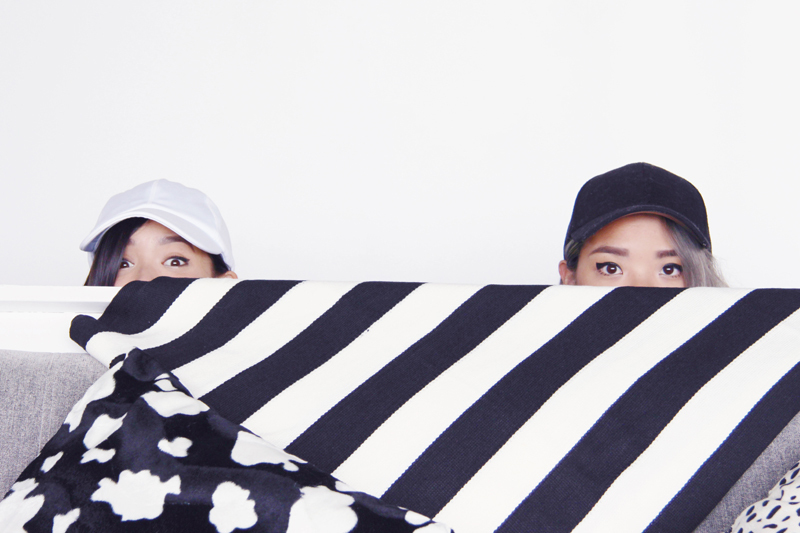 We answer our emails (in a timely fashion, usually). We strategize, negotiate, and administrate. We produce. We send invoices. We file our receipts. We have spreadsheets, Google Docs, and a whiteboard. To do the fun stuff we have to do the…not-so-fun stuff. But in order to even have the opportunity to do the not-so-fun stuff, we need you! 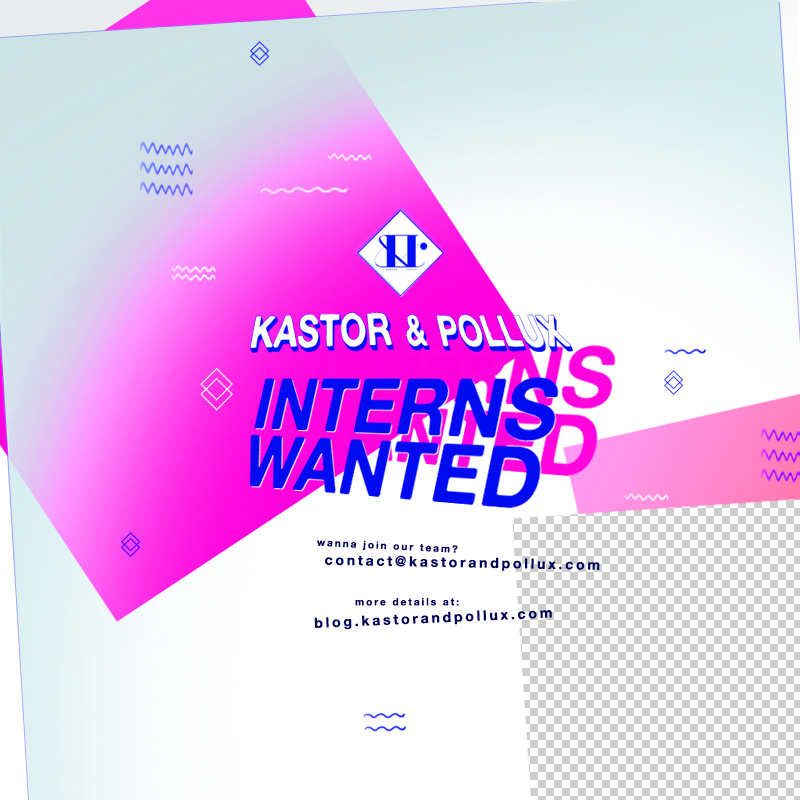 Back in January when we did our first call for interns, we didn’t really know what to expect; to be honest, I aimlessly put up a post and crossed my fingers and my toes that I wasn’t completely out of line in asking for a bit of extra help. By some twist of fate, we were connected with Ema and Olivia who gave us the first taste of working with a team that extended past our selfish needs and wants. (For potential to stay on board for longer, upon discussion). Positions – up for negotiation, based on needs, desires, and skill-sets. As you may/may not already know due to our incessant social media updates, Dani and I recently moved into a brand new loft together. We figured it was the next step in our lifelong relationship together, and we were right — so far it’s been the most *beauteous* experience, like, ever. We get to hang out ALL THE TIME, our closets have become exponentially larger and we’re approximately 1 million times happier. Though we’re still in the middle of getting settled in, here’s an obligatory set of !HOME TOUR! 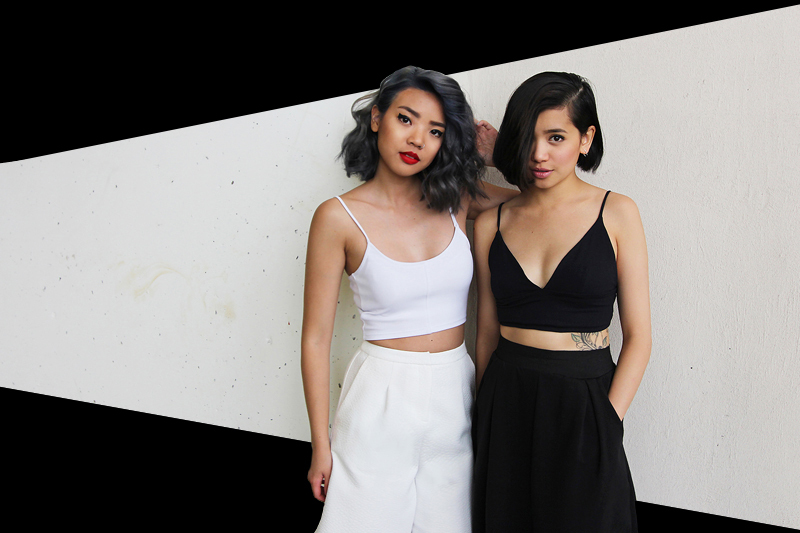 photos for a ~glimpse into our new lives~ (and, as mentioned, our growing closets featuring the most Forever 21 in the world). Dog butts. That is all. Summer Treats r the best treats, amirite??? Bcuz I don’t have air conditioning I rely on cold treats to avoid physically melting. I make about 2.3 trips a day to the convenience store (on average) to grab some sort of ice treat. Sometimes it’s a slushie, sometimes it’s a snow cone, but it’s usually a popsicle. 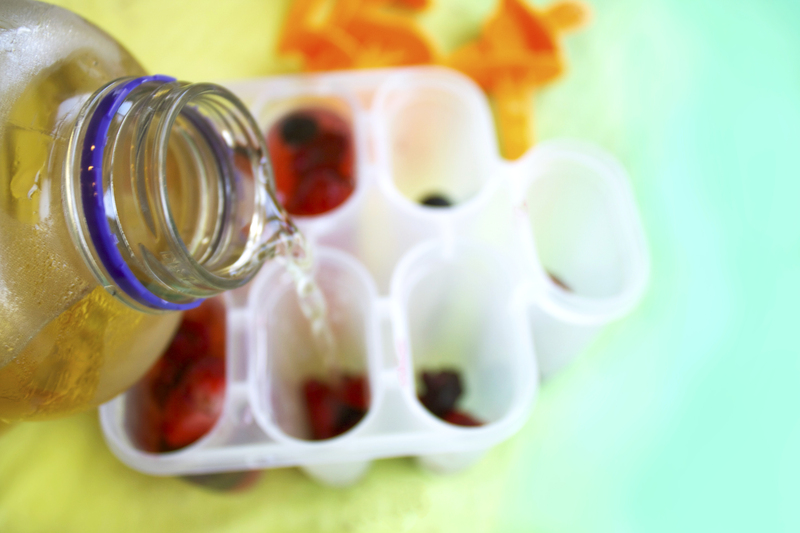 Fortunately for me, I recently made a genius purchase: a popsicle tray. Yes, folks, that’s right! I can now have unlimited popsicles!!! This is exciting. 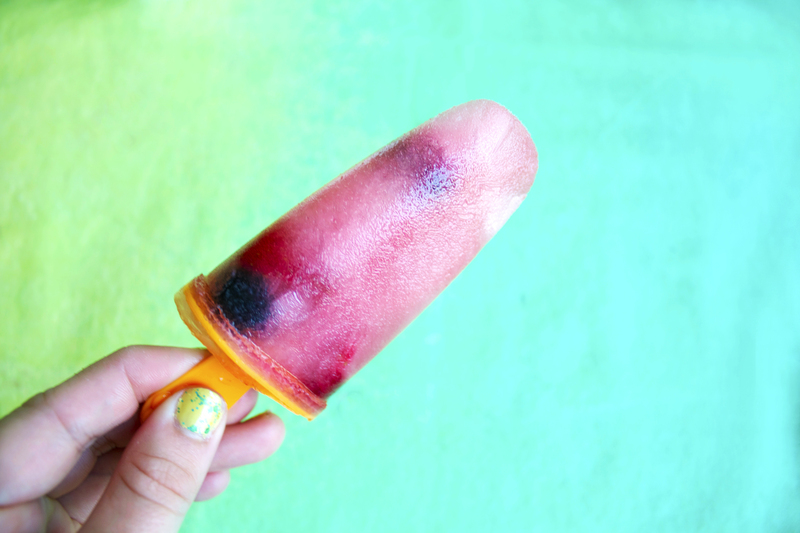 If you don’t already have one, go get one, right now, and then make these awesome fruit popz! 2. I have an abnormal love for white grapefruit juice. 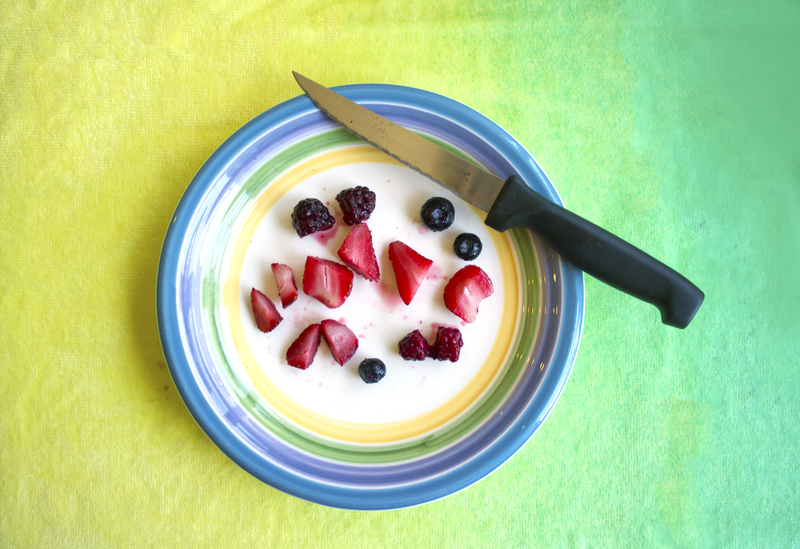 Cut your berries (or personal fruit preference) into smaller bits. 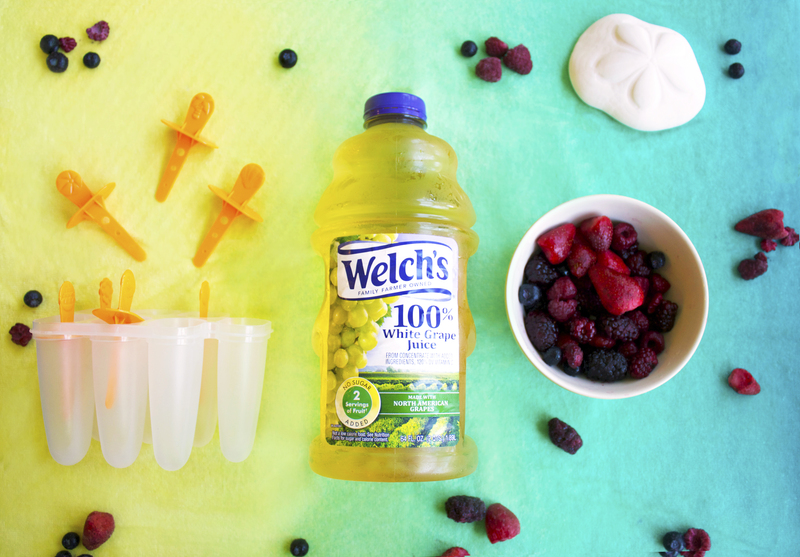 Fill each popsicle mold about 1/3 way full with fruity goodness. 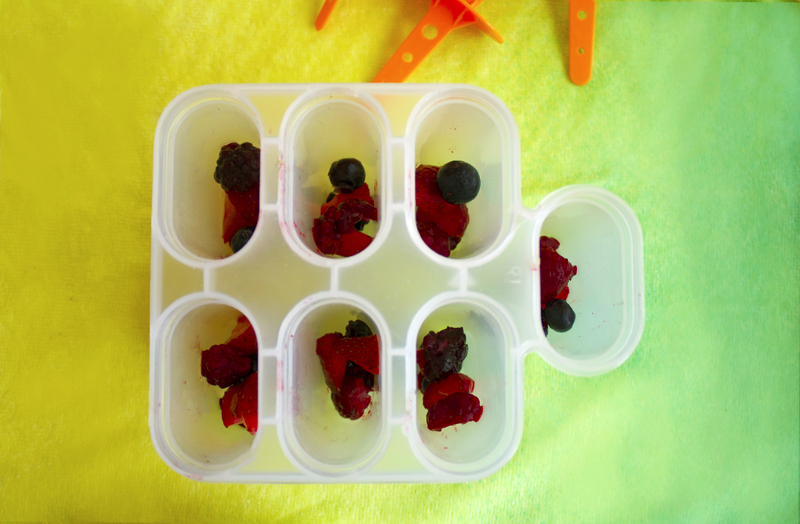 Once there is a desirable amount of fruit in each mold, fill them up with the white grapefruit juice. 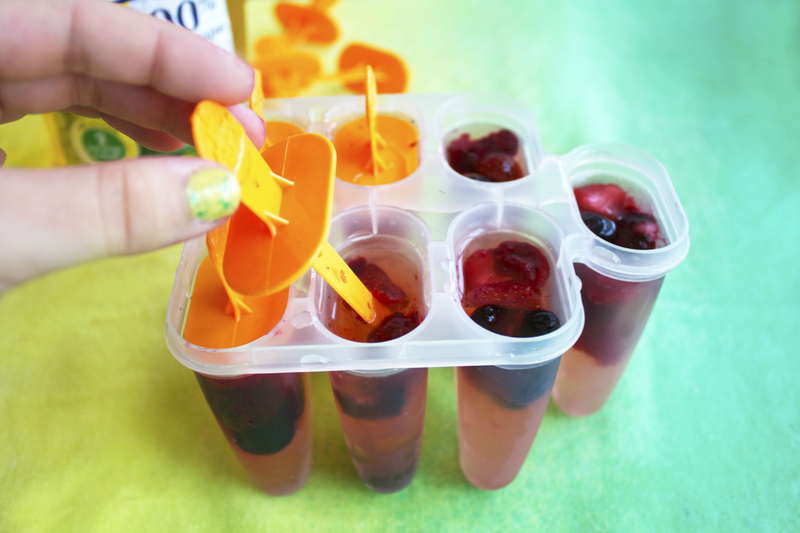 Put the provided popsicle sticks into each mold. They are now ready to go into the freezer! They will need about 2-3 hours to be fully frozen. Try not to be impatient like me and pull at the sticks every half hour to see if they are frozen, they won’t be. 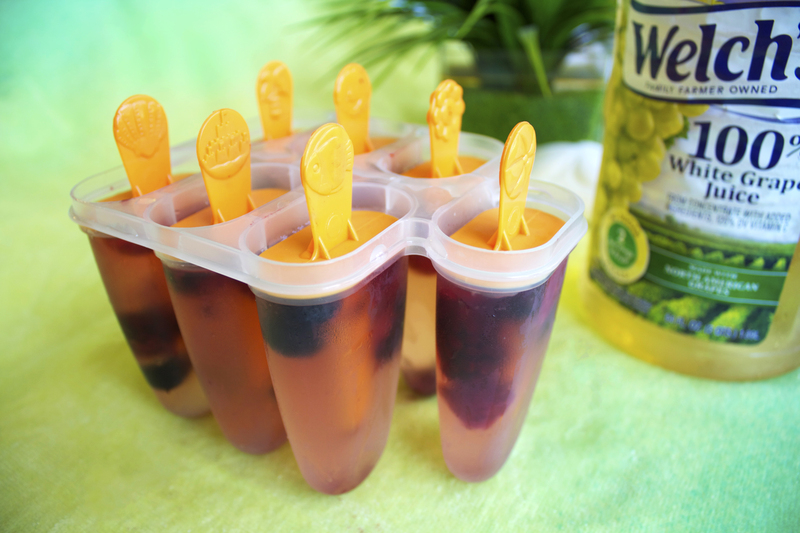 If you have a pool it’s probably a good idea to throw a pool party immediately and serve these pops. If you don’t have a pool, sprinkler parties r cool too. You can follow Ema on Instagram @ewaltez!!! It’s National Ice Cream month – didn’t you know? Since infancy, I’ve maintained an affinity for mint chocolate chip ice cream. While my appreciation for the flavour might stem from an infatuation with the perfectly pastel colouring, an inherent…peaceful quality to all things mint-flavoured(??? )…also lends itself well to my treat consumption patterns. In celebration of our favourite summertime snack (and in celebration of summer in general), we decided there would be nothing better than heaping piles of mint ice cream to accompany our mint outfits. And while the cones may be MIA from these photos, trust us when we say that they existed (though they didn’t last long). When it comes to posing in dark abysses, you better believe that we bring ~da sass~. Questionable? Maybe. But while things may be hectic, that doesn’t mean we can’t throw on a pseduo-bucket hat and (try and) W E R K.
Though we’ve been practicing the art of cross-coordination since time, we’ve never found a match in heathered grey heaven quite like this Stella McCartney head companion and this split tank top by way of 10 Crosby Derek Lam. OoooO DUALITY. oooooOOoo FASHION. 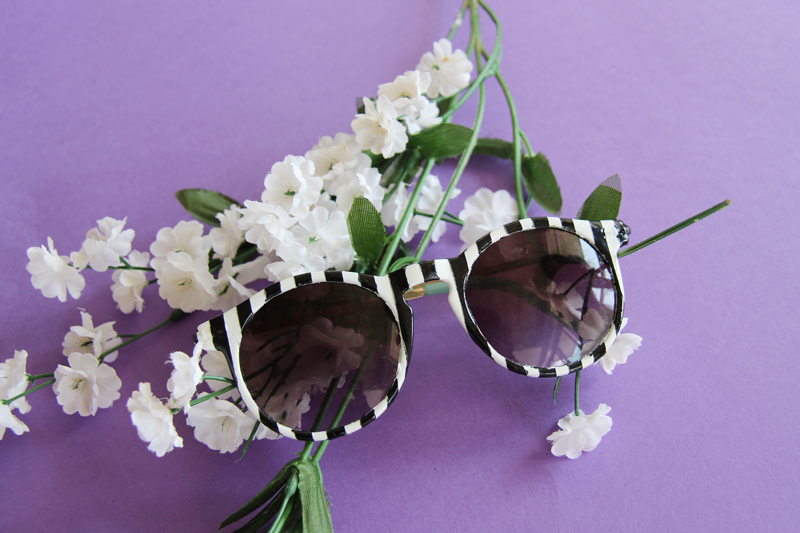 Since we have a penchant for anything a lil’ kookier than your average, we took it upon ourselves to jazz up two pairs of sunnies from Call It Spring. Though they were fun, candy-coloured numbers on their own, all we needed was a little time and nail polish to kick them up a notch. So grab your CrEaTiViTy HaTz, boys and girls, we’re goin’ on a DIY adventure!!!!!!!!!!! 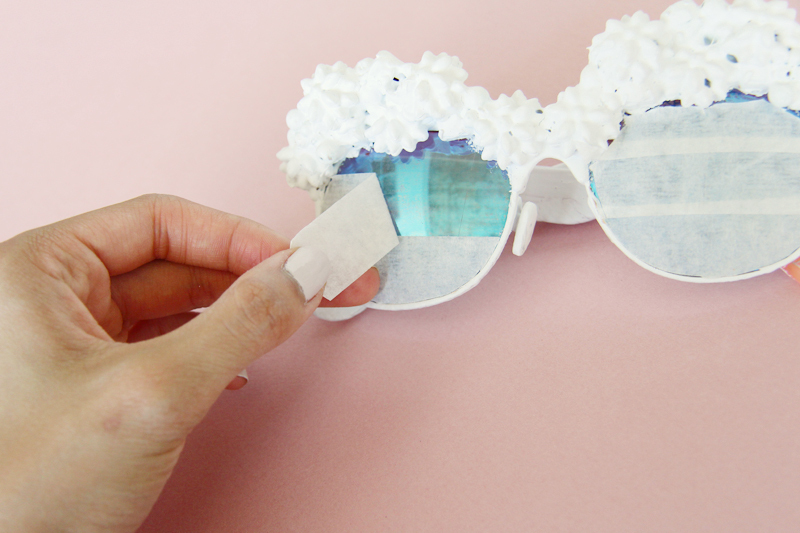 Coat the frames in 3 layers of white nail polish. Be sure to wait for each layer to dry before applying a new one! 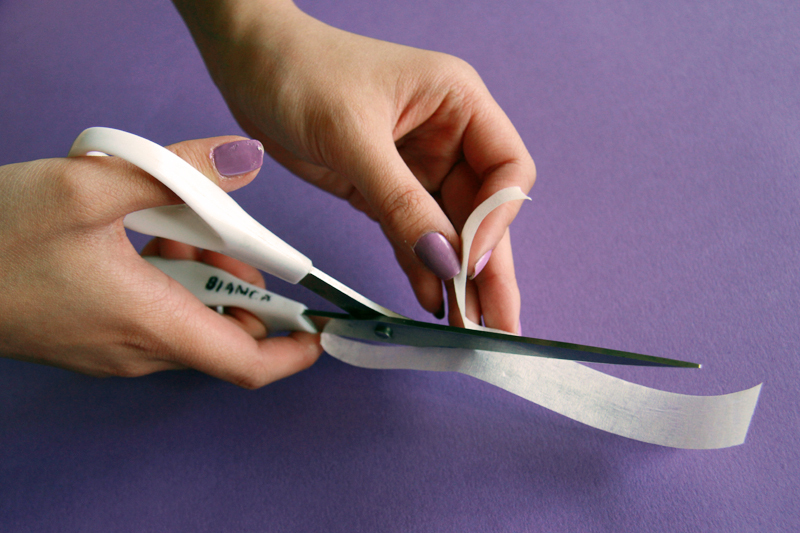 Cut 4-inch pieces of tape lengthwise into thinner strips. Space the tape strips equally across the dried frames. 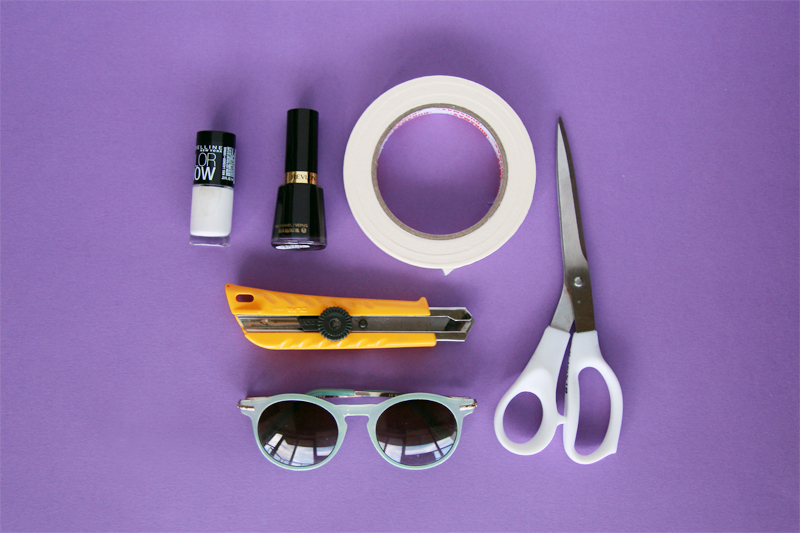 Coat the exposed parts with black nail polish. 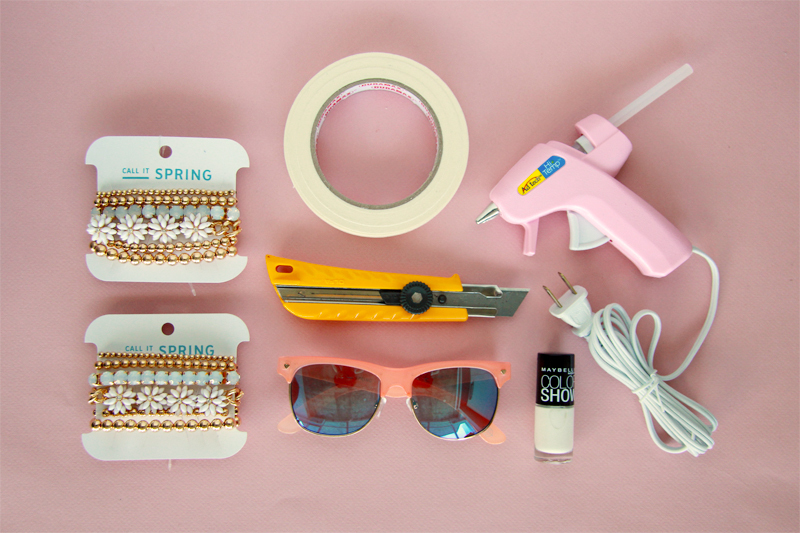 Carefully peel off the tape. 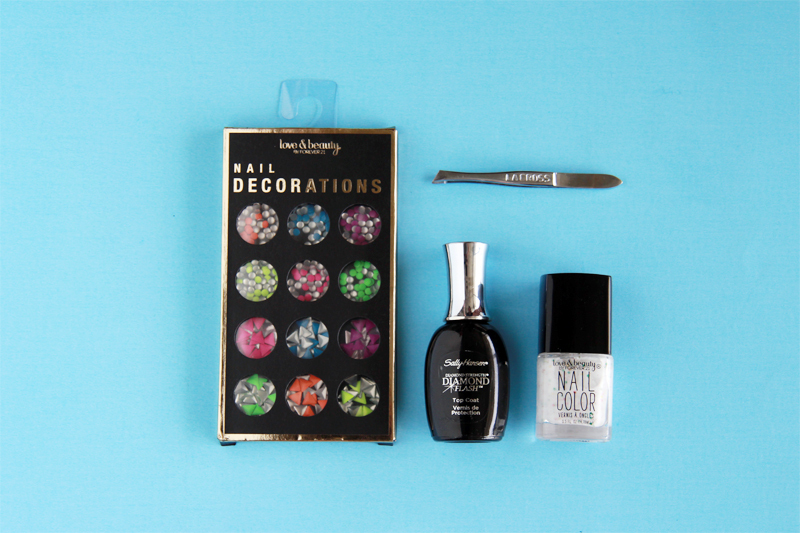 We didn’t wait for the black nail polish to dry to avoid cracking or chipping. 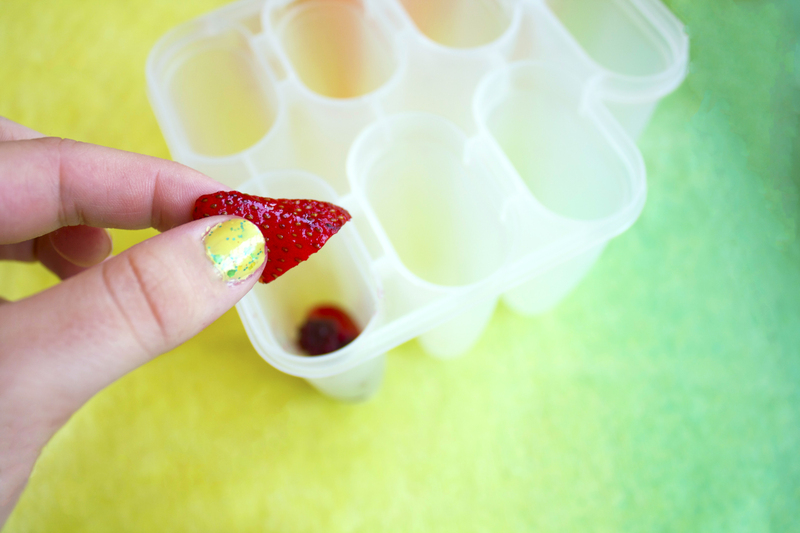 You can also touch up any stray marks using nail polish remover. 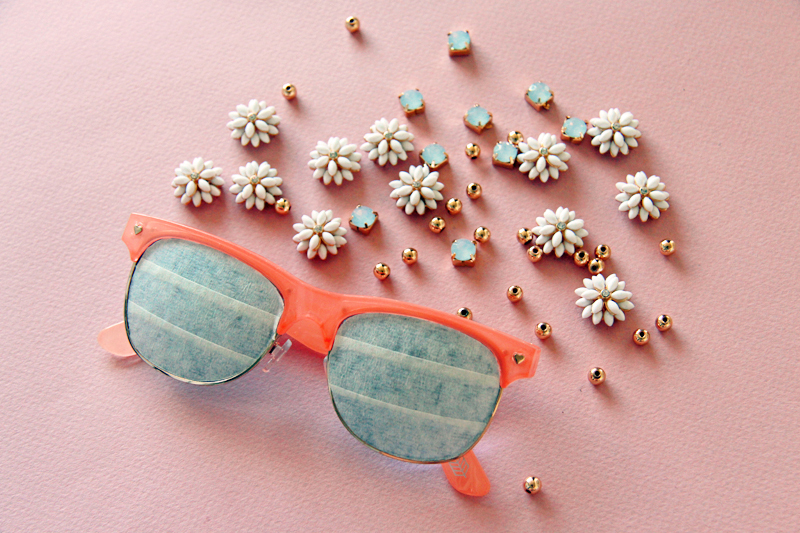 Set the sunglasses to dry before wear — preferably surrounded by plastic flowers because #cute. 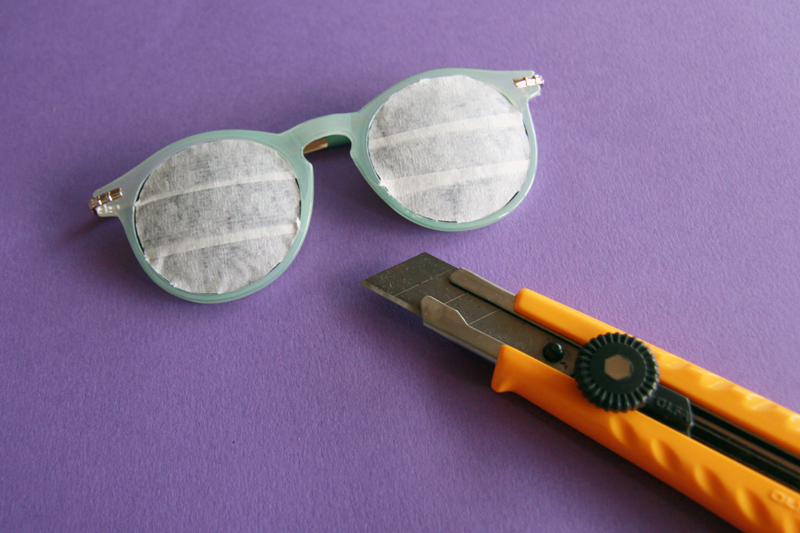 Completely cover the lenses in tape and use an X-acto knife to trim the excess. 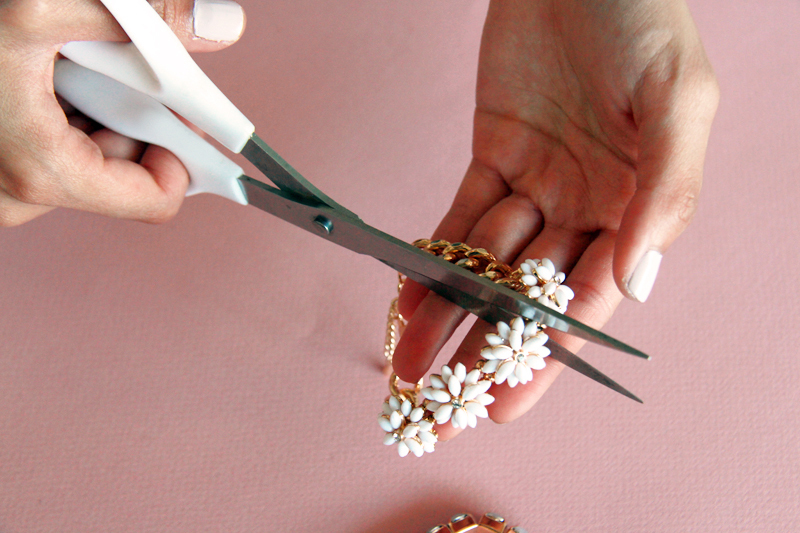 Break apart the costume jewellery using scissors. 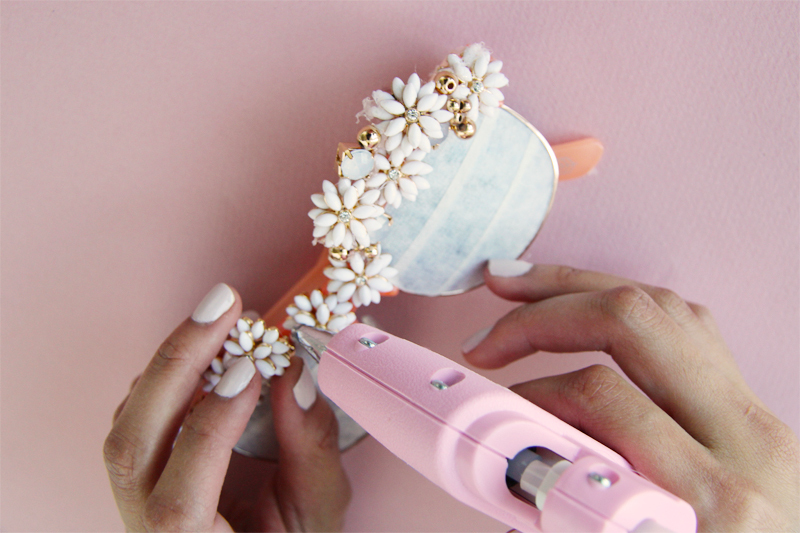 Use a glue gun to begin a floral collage of sorts. 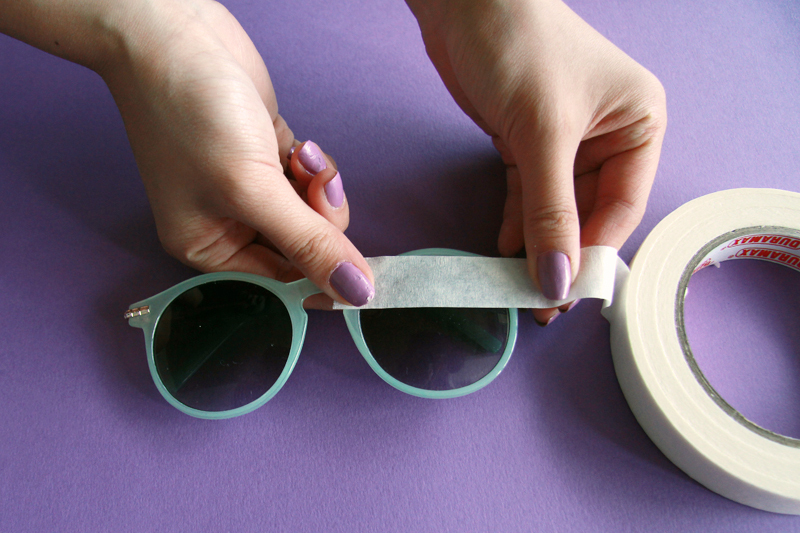 Coat the frames in 3 heavy layers of white nail polish. Be sure to wait for each layer to dry before applying a new one! 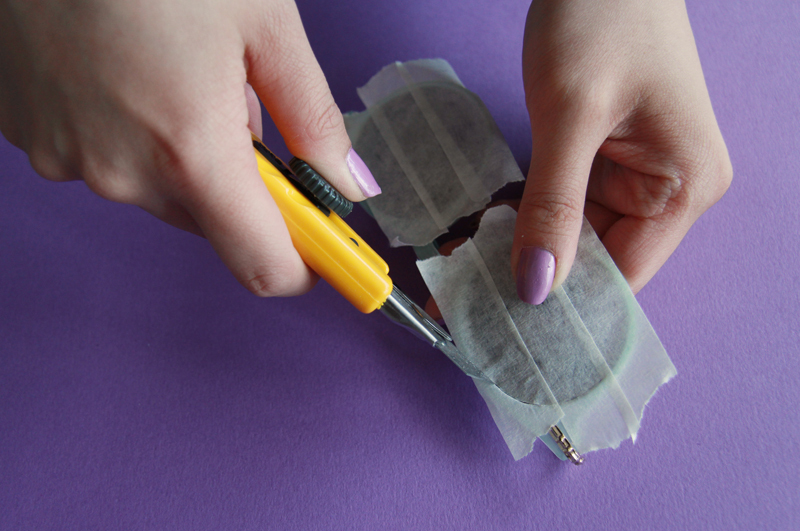 Carefully peel off the tape. 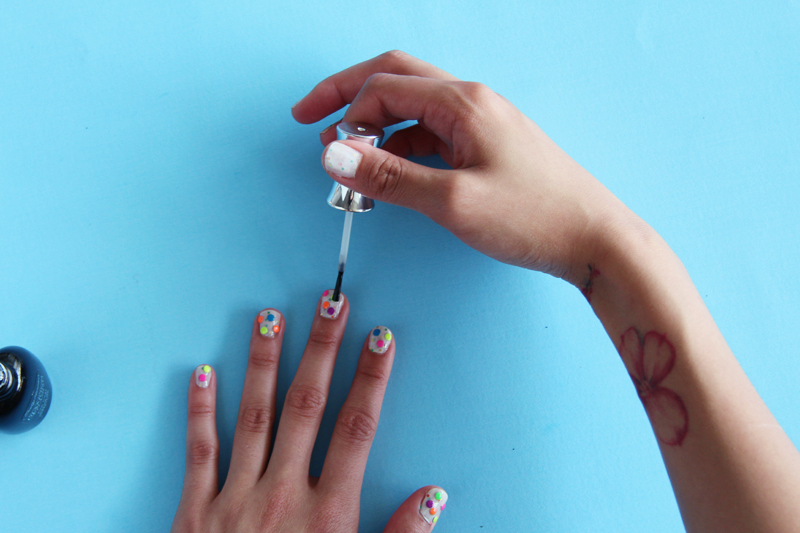 You can also touch up any stray marks using nail polish remover. 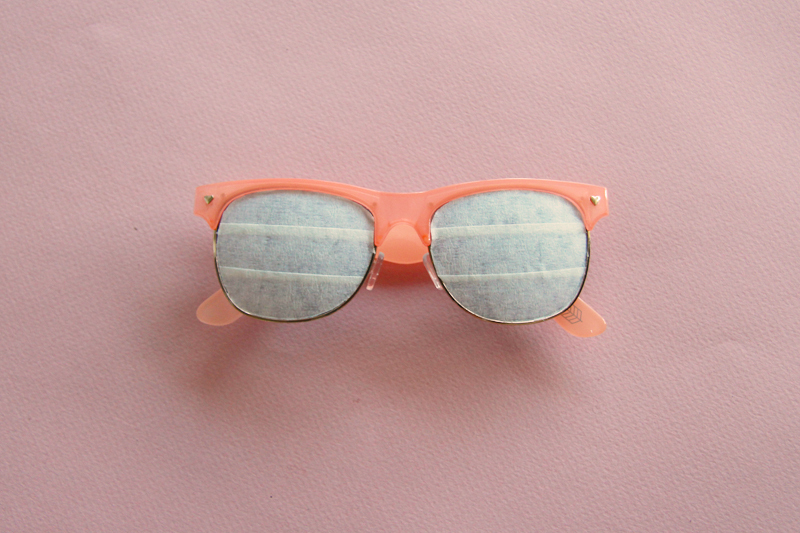 Set the sunglasses to dry before wear. 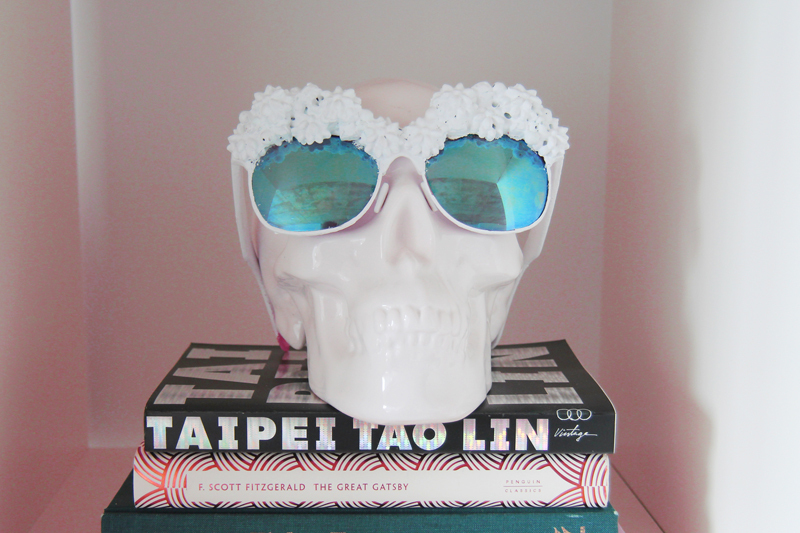 We put ours on a decorative porcelain skull because #interiordesign. 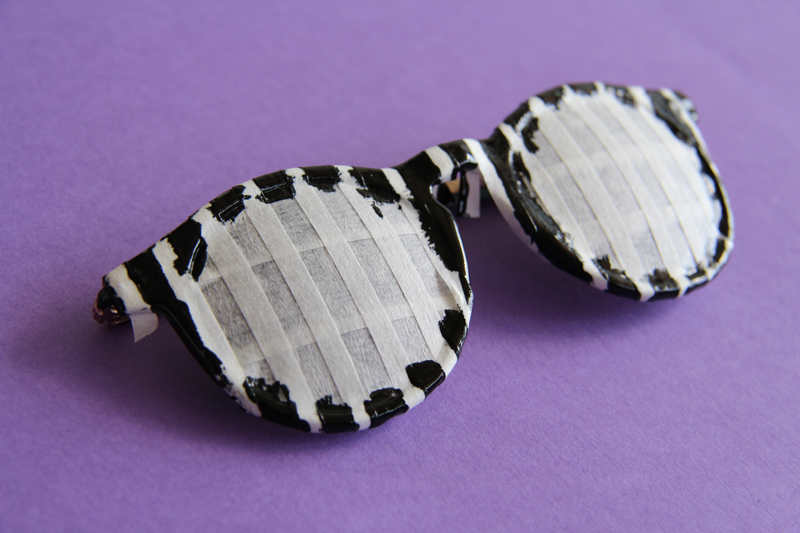 Now you’ve got two pairs of funky eyewear to protect your peepers ~in style~. 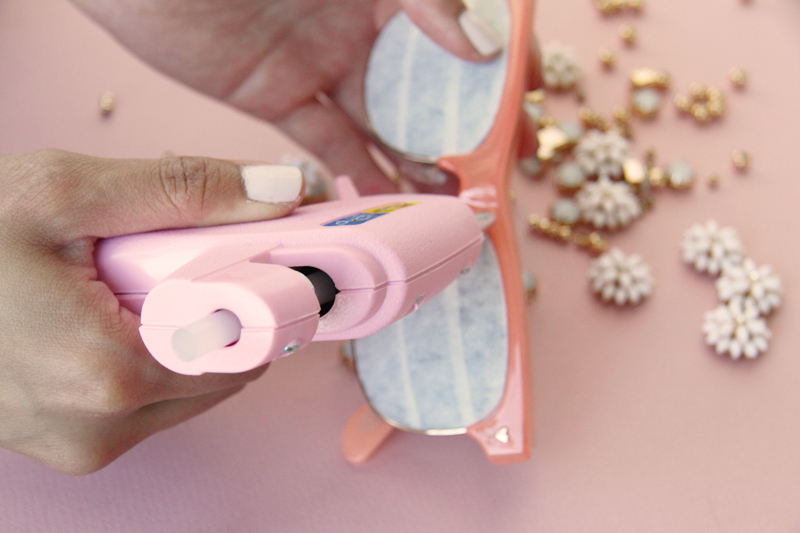 Long gone are the days of squinting in the sun and causing damage to your corneas. You’re welcome!!! We love you too!!! Nail art has always been a strange and uncharted realm for Danielle and I — we’re more of the solid, neutral polish types. However, we’ve been dressing quite #minimalistic as of late, meaning our inherent quirkiness needs to surface in some way or another. 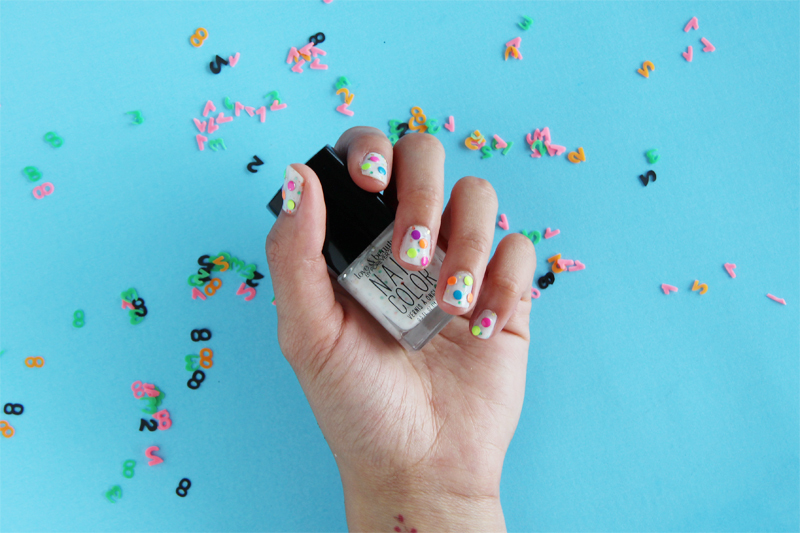 Enter Forever 21’s KoOkY nail options — sure to put the *fun* in a *functional* look by way of confetti, glitter, and other childlike things we may or may not thoroughly enjoy on our 22-year-old fingertips. 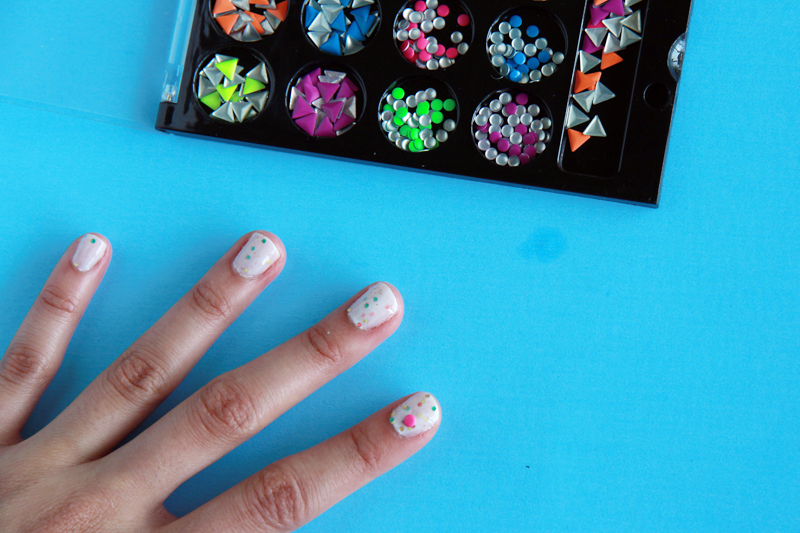 This past weekend, we stocked up on nail colours and accessories to bring you a quick and easy way to jazz up yo digitz. YOU’RE WELCOME. So there you have it, boys and girls. 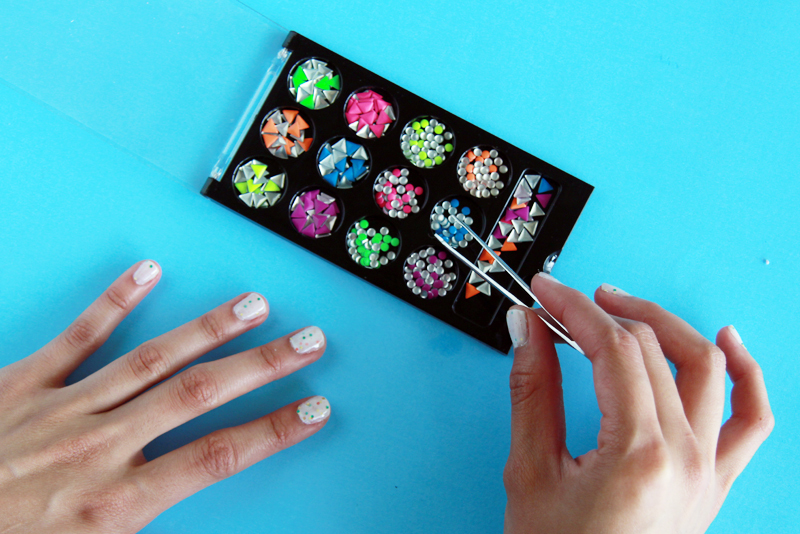 Dazzling nails for a dazzling human. Life changing — we know. How are you guys doing? According to Bianca’s shirt, we’re doing OK!!! (But we are – seriously). Hey hi hello! I know it’s been a while, but…better late than never, amirite? 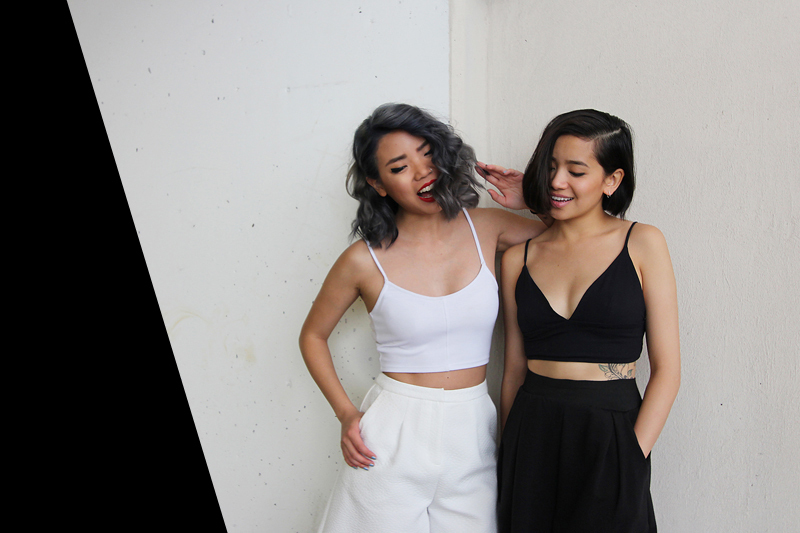 About a month ago, we teamed up with our pals at Intermix to rummage through their perfectly curated Bloor St. store and play dress up. For one full day, we were surrounded by a smattering of nice and cool and above-average clothing: and this is the first of three looks that we put together. Sometimes, it’s nice to have a variety of fancy garment bags lurking around your mediocre/not-fancy kitchen. Summer is finally upon us(!!!!! ), and that’s a cue to whip out both the toe cleavage and FULL-ON TOE REVELATION (if you haven’t already). Though it means we’ll have to groom the feet that have been hibernating in dark, moist holes a.k.a. winter boots over the last eight months, it’s a chore we’re more than happy to perform because #cute and #pampering and #girlytime. So, today we bring you this bare foot exposé in the form of a ~Summer Shoe Video Lookbook~ featuring 10 styles available at Call It Spring right at this very second. 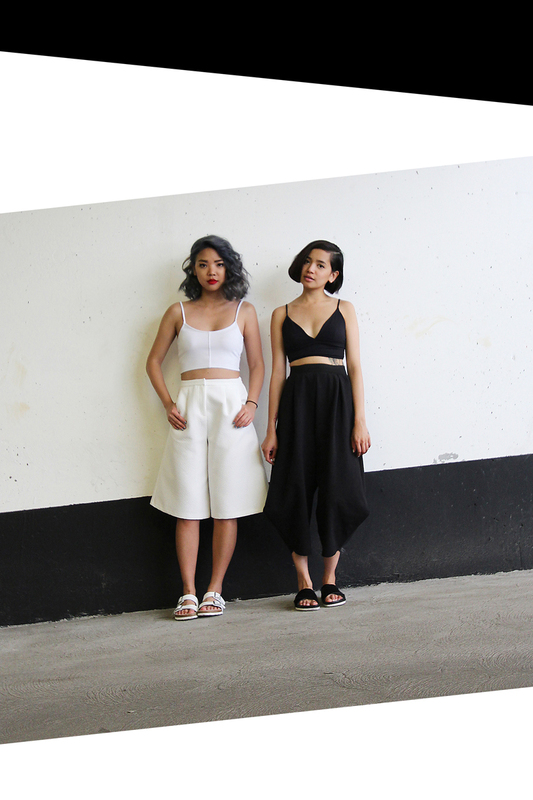 We included a whole slew of seXXXy sandals, matronly mules, gangsta gladiators, and SuPeR sneakers – all of which are essentially a requirement for any productive summer. That said, we hope that you thoroughly benefit from our very informative documentary (read: outfit video) and the following grass-gilded, cloud-dazzled photos. Now, go forth and enjoy the sunlight!!! Nothing says summer like a fun night out with friends (*AWWWWW*). But, a fun night out with friends isn’t truly a fun night out with friends if it’s missing a pair of sassy heels to dance in. 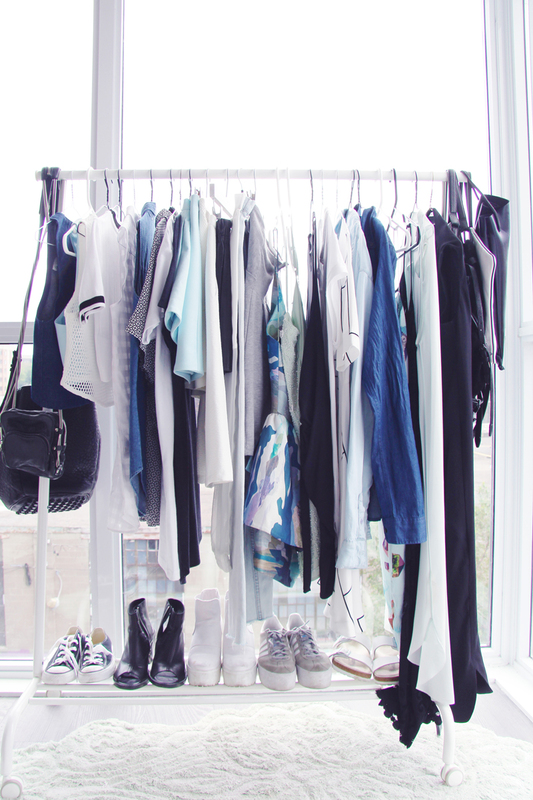 We picked white and baby blue numbers to change things up, as the bottom of our closet is stacked to no end with black platforms. Light shoes are just as practical as dark ones, ladies!!! Don’t be afraid!!! Sadly, “sports” is hardly in our vocabulary. Though I was once a gymnast and Dani a track star, we have succumb to a lifestyle of comfortable beds and flaming hot Cheetos. 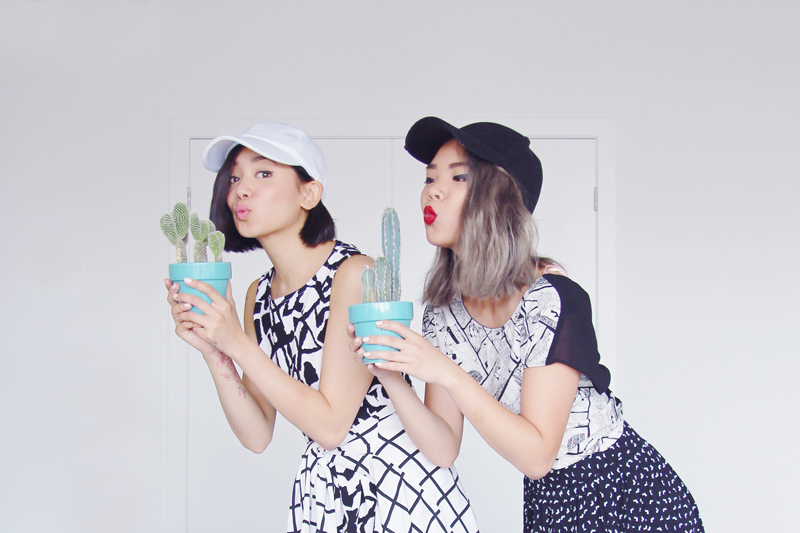 But, this doesn’t mean we can’t pretend to be SpOrTy GaLz via baseball caps, bra tops, and yoga pants. 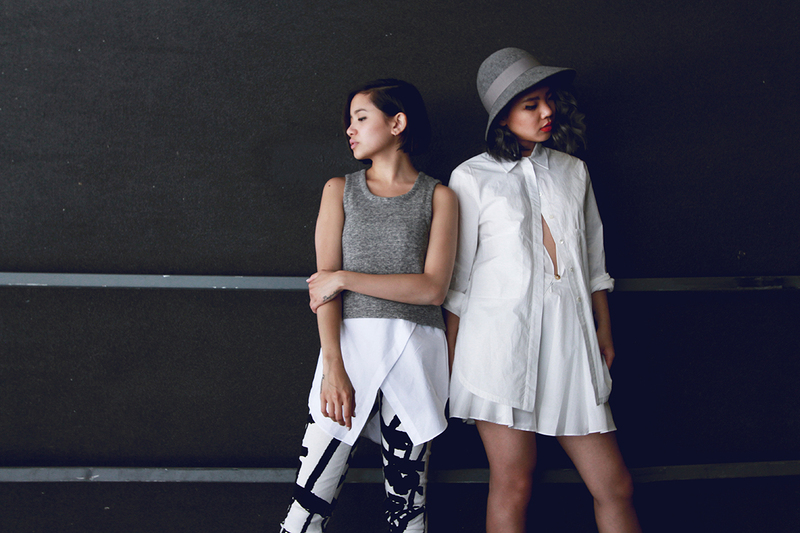 We’ll throw on some sneaks or Chelsea boots and we’re good to go. “WoW, coming from the gym?” they’ll say. 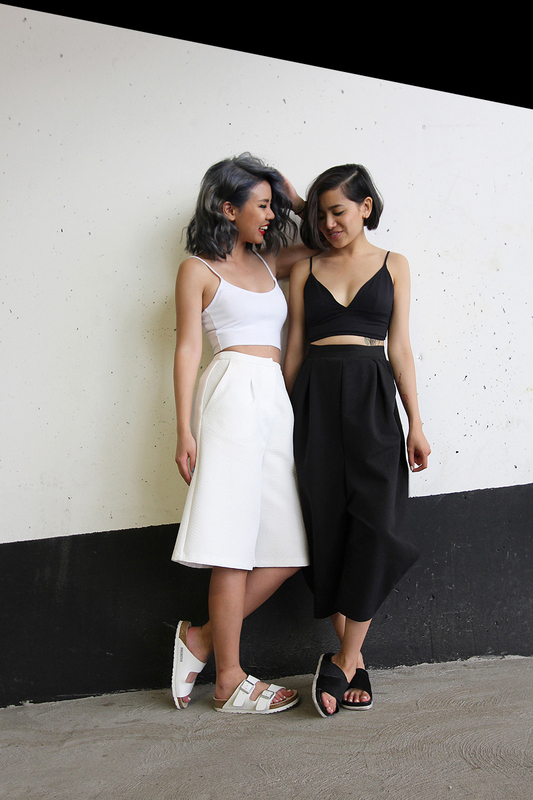 “Yes,” our outfits will reply. 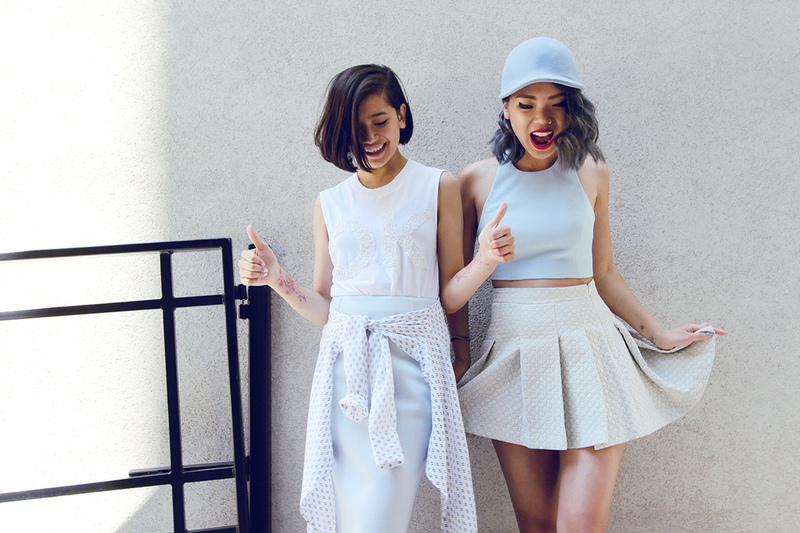 Patio chillin’ is by far our favourite facet of summertime luvin’. Going out for lunch or drinks or lunchtime drinks with your pals is already *the best,* but throwing in some sun and a cool breeze takes it to a WHOLE ‘NOTHER LEVEL. 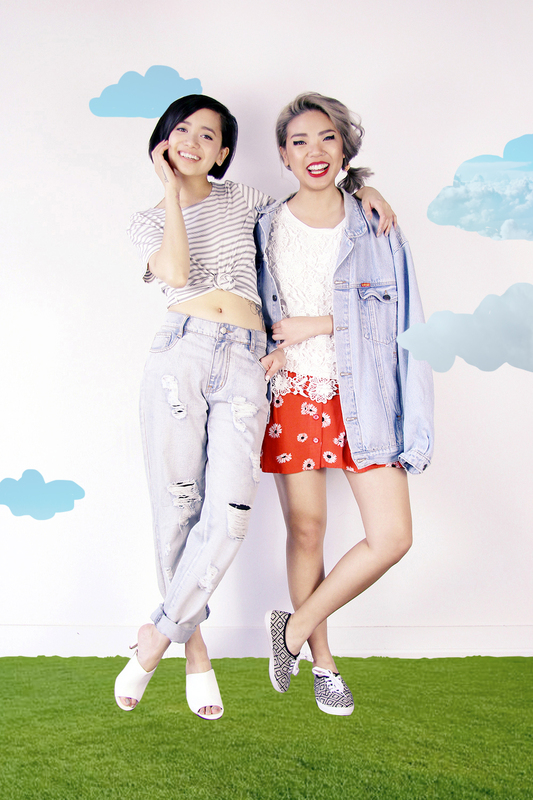 We chose boyfriend-style denim and comfy footwear for this look — lounging about and eating nachos demands it. Also, please note how Dani’s hand is in my pocket. 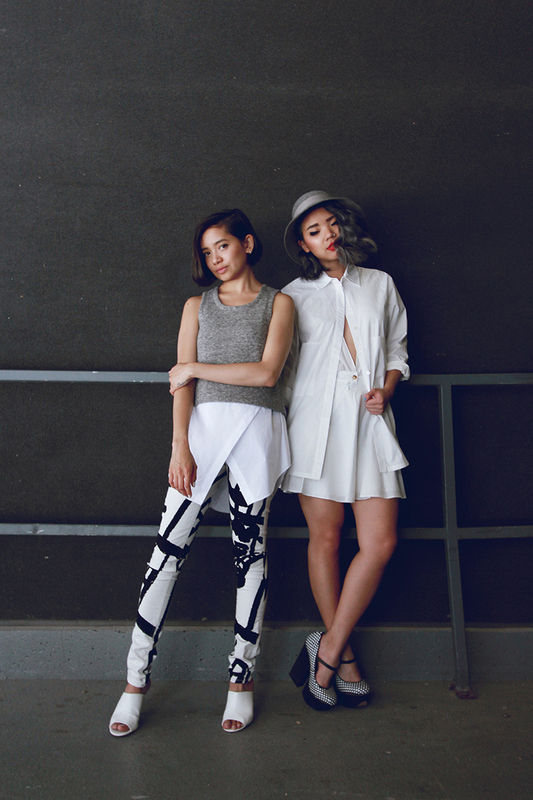 Out of all of these looks, these are the ones you’d catch us in repeatedly. 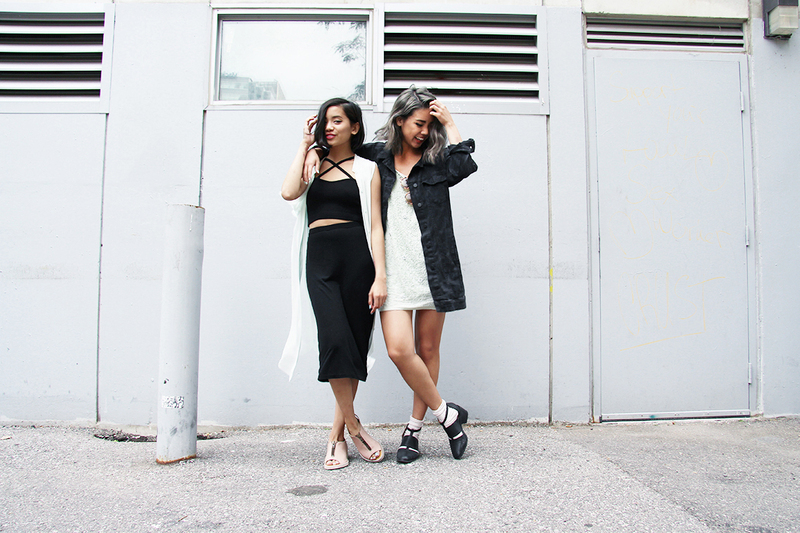 Because Dani works in the heart of downtown Toronto and I at a fancy outdoor shopping centre, we’re influenced to dress *hip* and *with it* at all times by our *hip* and *with it* peers. Plus, life is more fun this way. We think. 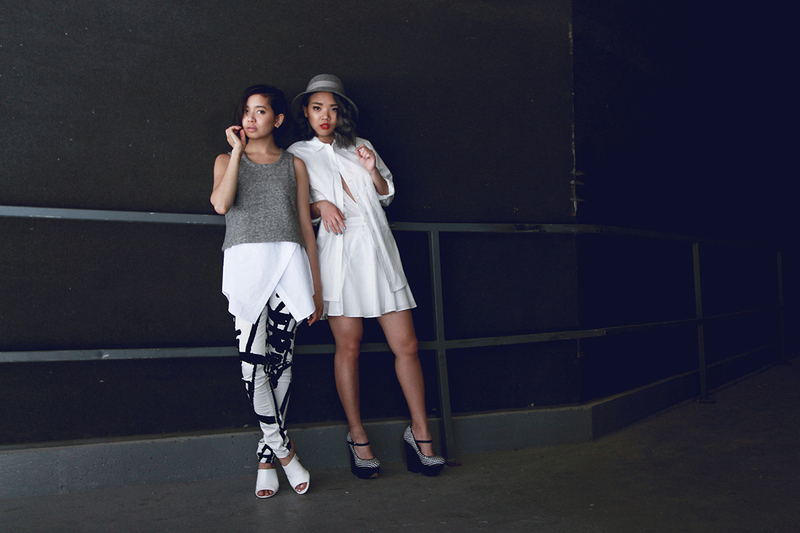 Anyway, my cross-strap wedges and Dani’s gladiators are perfect accents for our day-to-day outfits, bein’ so sleek n all. 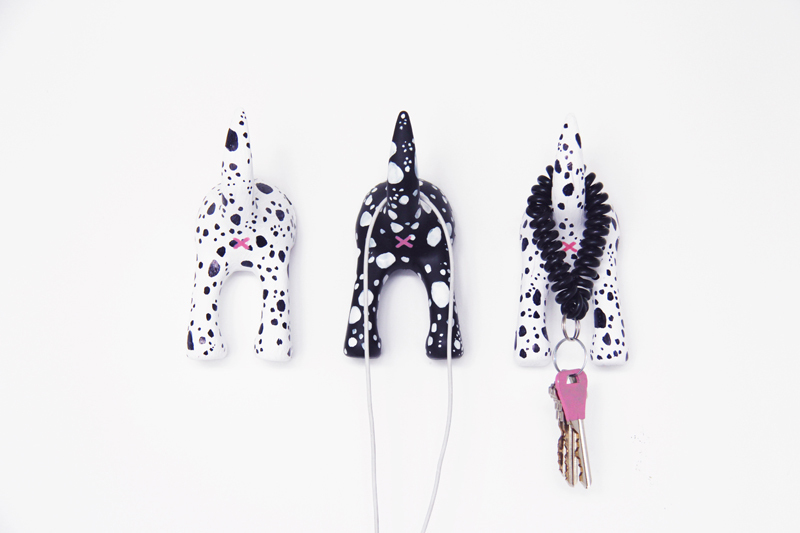 Park hangs are imperative for dog owners and picnic lovers like us! There’s always a good number of French bulldogs and a man who sells sandwiches out of his backpack at Trinity Bellwoods Park in Toronto, so it’s safe to say we’ll be ’round those parts p-r-e-t-t-y often this summer. Arm-bearing tops, shorts, and sandals are our sandwich-eating, blanket-sitting, sun-soaking uniforms; and they should be yours too.